Microbiological test such as Microbial count (Total count, Yeast and Mould count)by USP and other official methods, Preservative efficacy test, Sterility test and Endotoxin test , Particulate count etc. Our laboratory professionals and lab partners are highly experienced in conducting various routine and non-routine microbiological tests with reference to USP guidance chapter USP <61>, USP <62>, USP <2231>, and USP <2232>. These tests are a necessary requirements in having products released in the North American market, and countries worldwide. There are additional standards for food and cosmetic industries, including ASTM and AOAC. 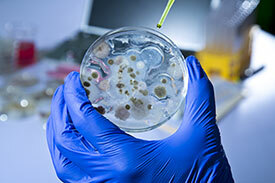 Krins Life Sciences experts, lab partners and professionals are well-experienced in conducting various microbiological tests, while adhering to strict industry standards. Additionally, Krins offers service support for biotechnology tests including ELISA and allergen testing.